Ephesus was one of the great cities of the ancient world and the ruins here are some of the best preserved of any Roman site in the Mediterranean. Ephesus was founded by Ionian Greeks in the 11th century BC and flourished as a major city and sea port. The Temple of Artemis built by the Greeks was one of the Seven Wonders of the Ancient World. The city came under Roman control in the 2nd century BC, reached its zenith in the 2nd century AD with a population of 300,000 and later became an important centre for Christianity. 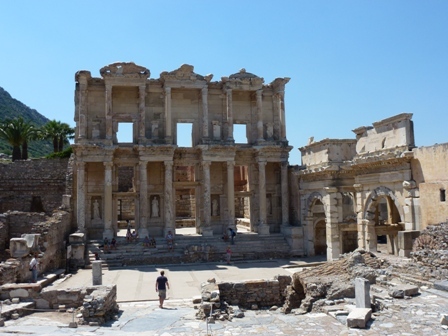 The Library of Celsus is the most impressive single ruin at Ephesus, a two-storey front facade of the original building with pillars, statues and windows. The Street of Curetes climbs upwards from the library, lined by columns and facades of shops, temples, houses, public baths and a brothel. The vast amphitheatre seats 25,000 people and still holds concerts today. The Ephesus Museum in nearby Selcuk has an excellent collection of artefacts and statues from the ancient city. The Greco-Roman ruins at Aphrodisias are some of the most impressive in the region. The city contained the most important temple to Aphroditis, the goddess of love and was an artistic centre with one of the ancient world's most famous Schools of Sculpture. Many of these sculptures can be seen in the small museum on the site. Aphrodisias also contains one of the largest and best preserved athletics stadiums in the ancient world. Organised group tours: Click here to see 10 tours to Western Turkey which may include Roman Sites in Turkey.